On Oct. 2, 1993, George H. W. Bush was about to hit a shot out of a Spanish Country Club bunker when his playing partner, head pro Jerry Roberts, gave him a tip. 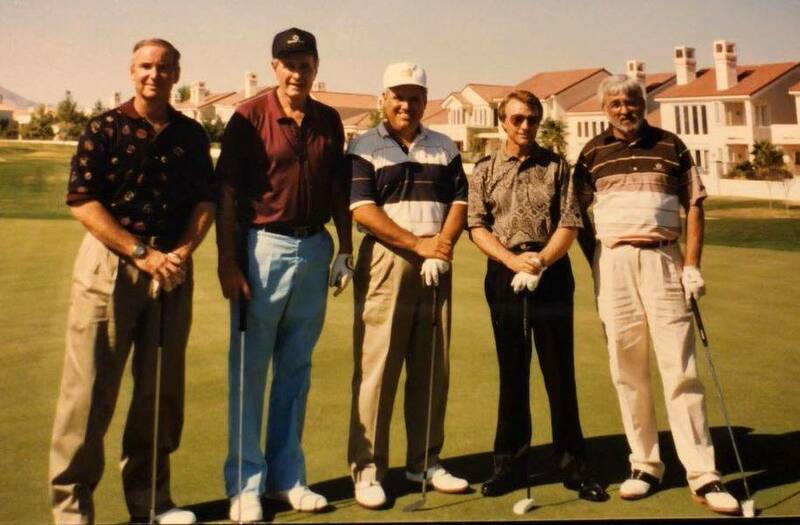 Gary Primm, George H. W. Bush, Gil Cohen, Jerry Roberts and Gordon Sarret on Oct. 2, 1993, at Spanish Trail Country Club. Courtesy photo - Jerry Roberts. 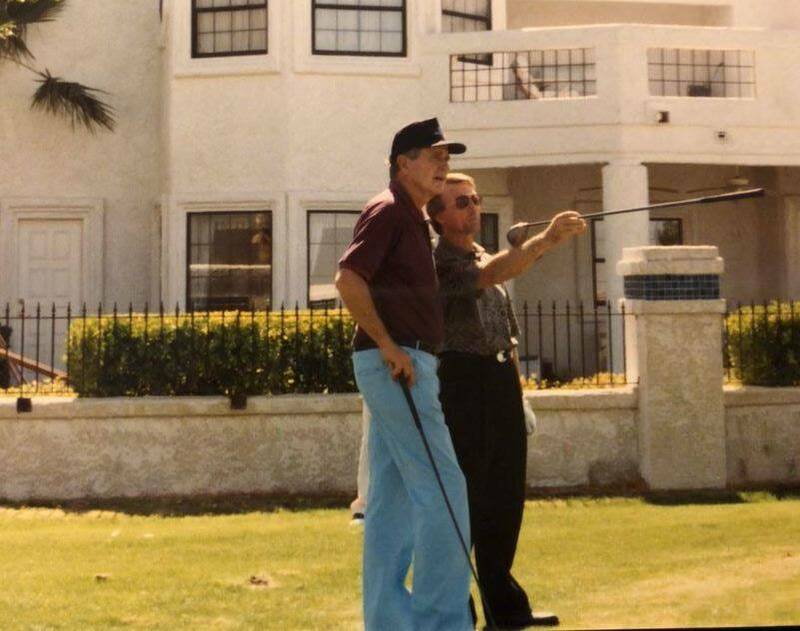 Spanish Trail head pro Jerry Roberts gives advice to George H. W. Bush during a round at Spanish Trail Country Club in 1993. courtesy - Jerry Roberts. On Oct. 2, 1993, George H.W. Bush was about to hit a shot out of a Spanish Trail Country Club bunker when his playing partner, head pro Jerry Roberts, gave him a tip. 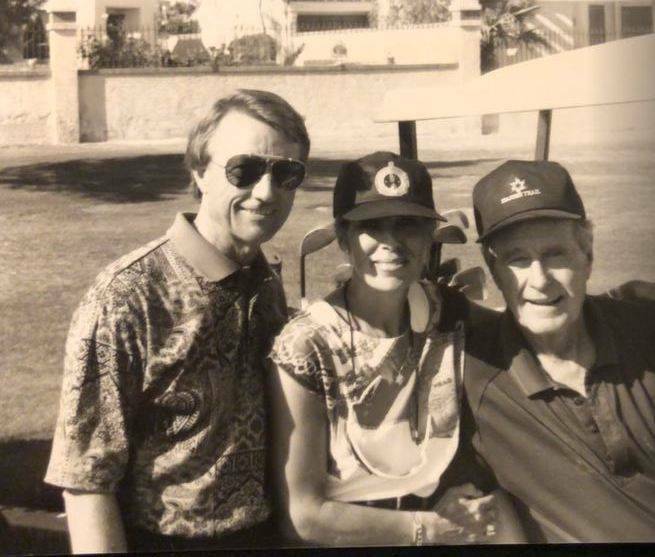 “I told him, ‘Turn the club in your hands to about 2 o’clock, which will open your club face, then open your stance, aim a little left and swing through to the target,’” remembered Roberts about the advice he gave Bush, the 41st president of the United States, who died Nov. 30. Following that round, Roberts, now Spanish Trail pro emeritus and a Las Vegas Golf Hall of Fame inductee, received a thank-you note. “You really helped me with that shot,” Bush wrote. The round came about nine months after Bush left office and Roberts was a replacement for Bush adviser and original Spanish Trail member Sig Rogich, who had an injured shoulder. Filling out the fivesome were Gil Cohen, Gary Primm and Gordon Sarret. During the round, which was kept as much a secret as possible until Bush arrived carrying his own clubs, Roberts had assistant pro John Ramsey ride ahead and alert members that the president was playing through. “The members were very accommodating and President Bush stopped and shook hands, talked to each of them and signed scorecards,” Roberts said. “He couldn’t have been nicer and more hospitable. The USGA labeled Bush as the “most authentic” golfing president because the game runs deep within the Bush family. Bush was a World Golf Hall of Fame member and his grandfather, George Herbert Walker, and father, Prescott, both served as USGA presidents. “He plays fast, but he also played true golf with no presidential gimmes or mulligans,” Roberts said about the three-hour round. “He played everything and his final score of 90 was totally legit. Bush also smiled when he met Roberts’ wife, Barb. “Oh yeah, I have one of those at home, too,” Bush quipped, alluding to his wife of the same name. Separate “Twelve Days of Christmas” deals are available at Golf Summerlin, Aliante and Las Vegas National. LPGA Tour pros Danielle Kang and Lydia Ko worked out at the Bellagio fitness area last week. Where: Orlando, Florida; The Ritz-Carlton GC (7,120 yards, par 72). When: Saturday-Sunday, 8-9 a.m. (Golf Channel); 9 a.m.-noon (KSNV-3). Where: Malelane, South Africa; Leopard Creek CC (7,287 yards, par 72). When: Thursday-Friday, 2:30-7:30 a.m. (Golf Channel); Saturday-Sunday, 1:30-6:30 a.m. (Golf Channel).